Years upon years ago I read several of the early ‘expanded universe’ Star Wars novels, but haven’t picked up many since then. Partially this was from general disappointment and disinterest caused by the prequel films, but it also was a result of simply falling behind on the many publications that came out. For newer novels the characters now had significant history I was unfamiliar with. It just seems daunting to catch up, particularly knowing these shared universe, media-tie-in novels can be hit or miss. What’s really nice then about this novel is that it is straight up Star Wars enjoyment that can be approached with knowing nothing more than the original movie. Additionally, although this is the second in a series, I haven’t read the first and the novel works perfectly fine as a stand-alone. The novel has few aspirations and the story has little frills. It is a simple action/spy story with a lovable feature character, Han Solo. Constrained by the existing films and novels the threats facing the characters will not appear realistic dangers at any point. Instead, the story here is about watching Han Solo thrive in those conditions that make us love him. The authors (writing under a pen name) put the most interesting touch on the novel in their writing of Solo’s thought processes, taking advantage of this point of time in the grand story as Solo begins to move from selfish, conservative scoundrel to someone who has begun to care about others and reconsider his social positions. Han rings conflicted, but true to our vision of Harrison Ford’s performance and the film directors/screen writers characterization. Finally, the novel also includes an interesting female foil for Han in the form of a character that shares a bit more personality with him than Leia, which works nicely and isn’t overworked. 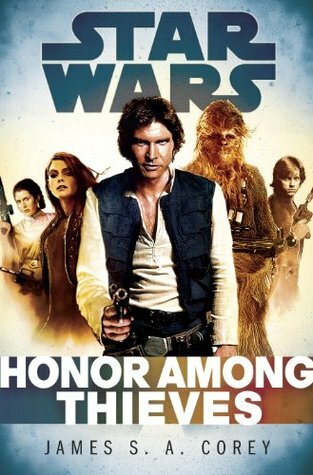 While this novel isn’t aiming to be a significant lot in terms of fiction or even Star Wars fiction, a ‘minor’ tale like this could easily be treated as a throwaway and go south rapidly, but instead this one is kept respectable and entertaining for an easy read for those that like Star Wars and those that particularly would look for a story set in the familiarity of this time period in the mythology.